With Friday's win over the Thrashers, the Washington Capitals moved within three points of the eighth-place Philadelphia Flyers in the Eastern Conference. Maybe some of Alex Ovechkin’s goal-scoring touch is rubbing off on Brooks Laich. Laich outscored his more-celebrated teammate on Friday night, getting two goals to Ovechkin’s one in the Washington Capitals’ 4-1 victory over the Atlanta Thrashers. 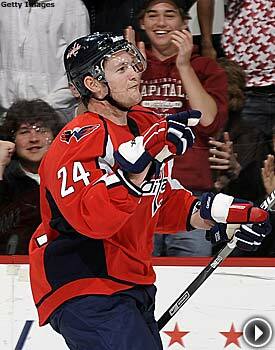 It was the third multi-goal game in his last nine for Laich, who had never scored twice in his first 214 NHL games. Ovechkin, the runaway leader in the goal-scoring race, capped the scoring with his 57th of the season, a wicked wrist shot 1:07 into the third period. It was his League-high 99th point of the season — he also assisted on Laich’s first goal. The Capitals outshot the Thrashers 37-12 and boosted their hopes of making the playoffs for the first time since 2003. The Caps and Florida Panthers, who beat the New York Rangers, moved within three points of the eighth-place Philadelphia Flyers in the Eastern Conference. It’s quite an achievement for the Capitals, who were last in the East when Bruce Boudreau replaced Glen Hanlon as coach on Nov. 22. Atlanta took a 1-0 lead when Slava Kozlov's slap shot beat a screened Olaf Kolzig at 11:41 of the first period. But Washington, which carried the play from the opening faceoff, tied it at 14:52 when Laich took a pass from Ovechkin and beat Kari Lehtonen from 20 feet. The assist extended Ovechkin’s point streak to eight games — matching his longest of the season. Laich's second goal gave the Capitals a 2-1 lead at 2:18 of the second period. He tapped the puck past Lehtonen in a mad scramble in front of the Atlanta net. The puck crossed the line an instant before the net was dislodged. Matt Cooke’s shorthanded breakaway goal at 14:41 gave Washington a two-goal lead, and Ovechkin snapped a shot past Lehtonen just four seconds into a power play. The Caps have 10 games remaining, including a tough six-game road trip. But after rallying from the conference cellar, they’re confident they can make the playoffs. Atlanta, which rallied for a 6-4 home victory over Calgary on Thursday, was seeking its second consecutive regulation win for the first time since Dec. 18-20. Kolzig’s 301st career victory was one of the easiest of his career. He had to make only 11 saves to tie former Rangers star Mike Richter for 22nd place on the all-time victory list for goaltenders. The light workload didn’t make him happy, though. Buffalo’s sagging playoff hopes got a giant boost as the Sabres’ offense came alive, scoring four times on its first seven shots to rout visiting Carolina. Derek Roy had two goals and an assist as the Sabres ended a four-game losing streak and moved within two points of the eighth-place Flyers while remaining a point ahead of Washington and Florida. "I liked the fact that our grit guys grabbed a hold of the game for us and won us the game," Buffalo coach Lindy Ruff said. "They made it really tough for them to play against. I thought that they were the difference in the game." The loss ended Carolina’s five-game winning streak and cut the Hurricanes’ lead over Washington and Florida in the Southeast Division to five points. "We beat ourselves," Hurricanes coach Peter Laviolette said. "We needed to be sharper, crisper, more effort, more attitude." Buffalo, which was embarrassed 7-3 by Pittsburgh on Tuesday, wasted little time in blowing out the Hurricanes. Daniel Paille, coming off a two-goal performance against the Penguins, opened the scoring 4:44 into the game when he fanned on his first attempt in the slot but had time to reload and snap the puck past Cam Ward. Adam Mair scored 22 seconds later. Roy scored a shorthanded goal at 10:51 and Paul Gaustad beat Ward at 13:46 to produce Buffalo's eighth four-goal period of the season. Patrick Kaleta and Roy added goals against backup goalie John Grahame in the second period before Scott Walker’s shorthanded goal with 8:30 left in the game ended Ryan Miller’s shutout bid. Ales Kotalik added a power-play goal with 3:21 remaining. The Sabres face another key game Saturday night in Toronto; the Maple Leafs are four points behind Buffalo and five behind Philadelphia with a game in hand on both. There must be something about Nationwide Arena that gets the Blackhawks revved up early. For the second straight visit, Chicago jumped to an early lead and went on to beat the Blue Jackets, who’ve won just once in their last nine home games. The win kept the Hawks’ playoff hopes alive and may have all but ended Columbus’. Chicago moved within five points of eighth-place Vancouver in the West; the Blue Jackets remained seven points in back of the Canucks. Chicago scored four times in the first period in its last visit to Columbus, a 7-2 victory on Feb. 13. This time, the Blackhawks connected three times on six shots in the first 13:12, knocking out Columbus starting goaltender Pascal Leclaire. Cam Barker scored 60 seconds into the game, beating Leclaire from a bad angle. Duncan Keith fired a pass from Robert Lang behind Leclaire at 11:21, and Dave Bolland knocked in the rebound of Patrick Kane’s shot just 1:51 later. The Blue Jackets came out strong in the second period and quickly cut the margin to 3-2 on goals 27 seconds apart by Fredrik Modin and Dan Fritsche. Kane gave the Blackhawks some breathing room at the 12-minute mark, nudging a loose puck over the goal line. Rick Nash, who’d been robbed twice by Hawks goaltender Patrick Lalime, finally beat him with a floater through traffic at 7:15 of the third period. Lalime kept the Jackets from getting the equalizer until Dustin Byfuglien made it 5-3 at 10:20, and Andrew Ladd added a power-play goal with 3:23 remaining. The NHL’s hottest team wasted little time in taking command against the struggling Blues, who lost for the 11th time in 12 games. Patrick Marleau’s penalty shot capped a four-goal first period as the Sharks won their 11th consecutive game, the longest streak in the NHL since New Jersey won its last 11 in 2005-06. The victory moved the Sharks three points in front of Dallas and four ahead of Anaheim in the Pacific Division race. Milan Michalek got the Sharks started by beating Hannu Toivonen 1:10 into the game, and San Jose added three goals in a span of 3:03 later in the period to put the game away. Jeremy Roenick made it 2-0 with a tip-in at 10:22, Brian Campbell fired Joe Thornton’s perfect pass behind a helpless Toivonen at 12:10 and Marleau converted his penalty shot at 13:25, beating Toivonen with a quick wrist shot after being hauled down by Erik Johnson. “Especially coming off the road trip, we wanted to come out strong,” Marleau said. The Blues came out more energized at the start of the second period and got on the board at 54 seconds when David Backes beat Evgeni Nabokov, knocking in the rebound of Paul Kariya’s shot. Toivonen kept the Blues within hailing distance in the final 30 seconds of the period with a series of key saves during a couple of scrambles on a San Jose power play. The Sharks had six of their eight shots in the period in the final minute. ''When you dig yourself a hole like that in the first 10 minutes of the game, to expect to climb out is unrealistic,'' Backes said. The Sharks completely shut down the Blues in the third period, surrendering only four shots. Nabokov finished with 20 saves for his NHL-leading 41st victory. St. Louis, 14th in the West, fell to 0-4-1 on its nine-game road trip. San Jose swept the four-game season series from the Blues, allowing only two goals in the process.